The Tower Park : Designed in the 19th century, this two hectare park of harmonious proportions offers numerous perspectives to the visitor's eye. It has recently been rehabilitated in a creative spirit which has preserved its natural aspect while endowing it with a literary purpose. The latter is made quite clear by the presence of reading ­ arbours, of a vegetal maze, of clearings meant to be used as stages, of giant alphabet letters, pennibs and herbarium pages. This intimist park where sap and ink meet, is favourable to quiet meditation but it often welcomes literary events as well, and its atmosphere encourages the idle visitor to invent his own new words and stories. Among the most remarkable species of trees, let us mention the Silver Lime tree, the Japanese Sophora, the Indian Chestnut tree, the Lawson Cypress, the Caucasian Fir-tree, the Spanish Fir-tree and the Sequoia. 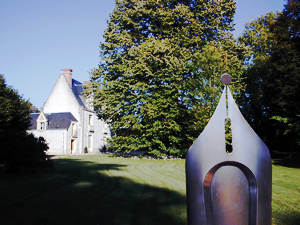 A five minute drive from Tours, on the northern bank of the river Loire.